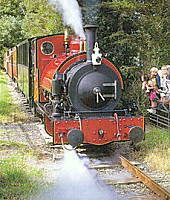 A narrow gauge line using steam locomotives, running inland from Tywyn on the Mid Wales Coast to Nant Gwernol. One of North Wales' newest tourist attractions creating a 25 mile link between Caernarfon, Dinas, Waunfawr, Beddgelert and Porthmadog. 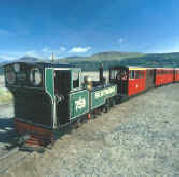 Little steam-hauled narrow- gauge trains run a 13 1/2 mile main line in miniature from the coastline at Porthmadog into the mountains at Blaenau Ffestiniog. 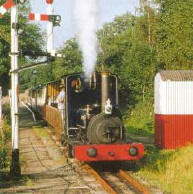 The 2ft gauge line offers a delightful 9 mile return journey along Llyn Tegid (Bala Lake), through the beautiful scenery of the Snowdonia National Park. Laid on the north-western slopes of Snowdon, it climbs 3140ft. 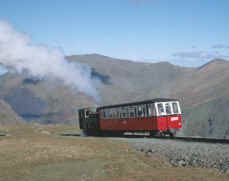 in its 4 5/8 mile journey from Llanberis to Summit Station. 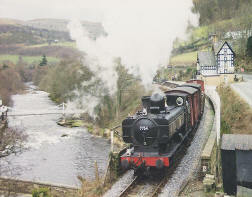 Runs through 8 miles of some of the finest scenery in Britain. 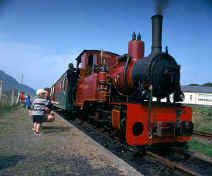 The Fairbourne & Barmouth Railway extends two and a half miles between Fairbourne Village and Penrhyn Point where it connects with a ferry which takes passengers across the Afon Mawddach to Barmouth.